River Dart side (though not quite on the water) hotel, with two bars. Adequate - but, like Dartmouth itself, gets far to busy during the summer. Parking is a nightmare - and, in recent years, a busy park and ride service has been very necessary. The blue rinse brigade arrive in their hundreds - and the few historic streets and quayside are thronged. 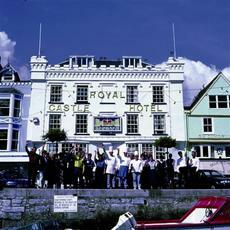 Straight off the boat and into the large and dominating Royal Castle Hotel that sits between shops and restaurants & sits back from the harbour. 2 bars, the smaller one on left as you enter is more of a sports bar and was busy, the larger bar at the back of the hotel just past the reception area is for drinkers and diners and that's the bar we headed to. Lots of age to this hotel, the main dining area has low beams and dark furniture. The walls have a mix of sporting items on the walls, including guns and sailing memorabilia. 4 hand pumps on the bar, the ales on during my visit were Sharps Doombar, Otter Amber, Dartmoor Jail Ale & Exmoor Ales Crew @ 4.8% which was the pint I went for. Being my first visit to Dartmouth and also with it being Regatta time I soon learnt that all drinks are served in plastic. Not normally something I like to drink my ale out of but this does enable you to wander the streets with your drinks (which people were doing) so during my visit I accepted it. Busy with diners with several locals drinking at the bar. Busy place when we visited. We sat in the older style Galleon bar which was nice enough. For some reason though we just could not settle here and the bar service was pretty bad too. Mary & all the staff made us feel most welcome. Very traditional and comfortable interior and very popular. Even just after noon on a weekday we got one of the last tables. Several ales on tap. The Doom Bar was very palatable. Food excellent and the service friendly and professional. The proprietor made an appearance as the place was so busy and he is definitely a character! The gents is like being in a giant microwave and certainly doesn't match the rest of the decor.